Far from being a quiet backwater on the axis from Dublin Castle to the south Kildare had its rebels and reactionary elements when the national question erupted into violence on Easter Monday 1916. Fifteen men from Kildare marched to the GPO in Dublin to take part in the Rising. After the surrender they were marched off to internment camps in Britain. When the prisoners of Easter Week were released they came home to a different country. All of Ireland was in rebellion and County Kildare played its part. “On the One Road” is the story of Kildare through the Rising, the Black and Tan terror, the Civil War, the Blueshirts era and the IRA campaigns through the 1940s and 50s and on to the recent phase of the Troubles. 208 pages, 68 photos, maps. 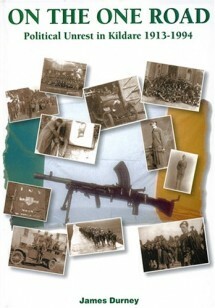 Contains list of all military and civilians from or killed in the county during the Troubles.